After conceding a head scratching tying goal in the dying moments on Monday, there was no way the Sabres would allow the same thing to happen again. Of course, we’re talking about the Sabres. Yielding leads throughout games all season, Buffalo’s killer instinct has been something that has come and gone on numerous occasions. 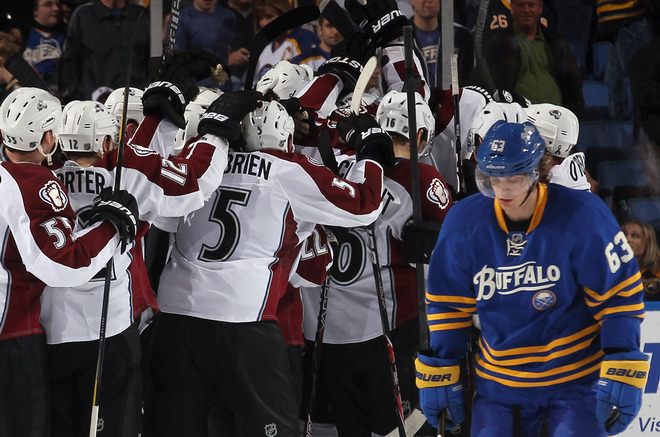 A defensive breakdown on Monday led to the tying goal, virtually the same play cost the Sabres last night. Jamie McGinn’s second goal of the night tied the game at four, sending the game to OT. The Avalanche went on to win the game 5-4 in a shootout as shootout extraordinaire Peter Mueller picked up the deciding goal. Of course, McGinn’s goal should have never happened. While being stuck with the same personnel due to an icing, Lindy Ruff had Cody Hodgson, Jason Pominville, Ville Leino, Christian Ehrhoff and Mike Weber on the ice. Not exactly the best defensive set Buffalo could roll out. However, they are a little short on lock down forwards without Jochen Hecht, Paul Gaustad and Nathan Gerbe for various reasons. My real beef was the defensive pair that Ruff chose. Mike Weber has been thrust from the sixth defensive spot to the fourth due to Tyler Myers’ suspension and Andrej Sekera’s illness. Weber played Gabriel Landeskog soft on his entry, his shot, the rebound and the following play behind the net. Weber is serviceable in a limited role, but not as a shutdown defenseman in the final moments of a close game. I have to question the thought process that Ruff had regarding who he was putting on the ice. The unfortunate finish tarnished a great game by Marcus Foligno, who had a pair of goals and three hits. 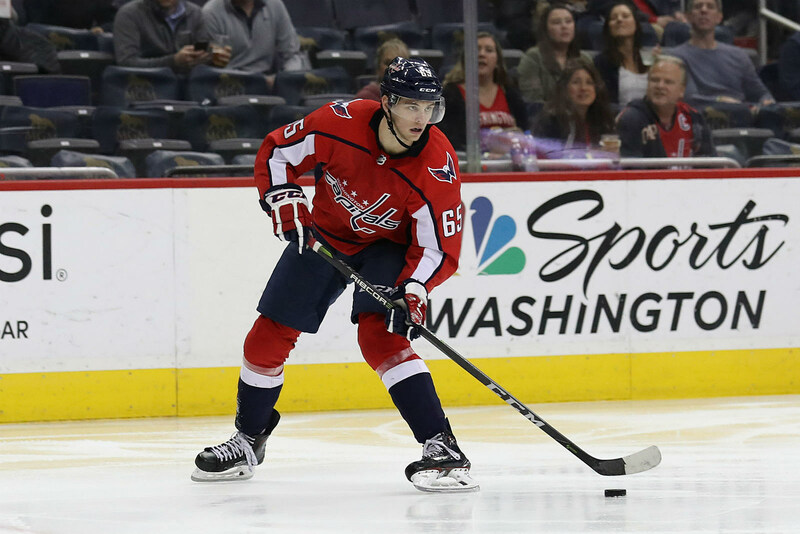 Foligno has meshed well, just like Corey Tropp, and is making a serious case to stick around beyond the re-call. Tropp has all but cemented his spot. Foligno’s pair were part of a +3 evening that saw the rookie lay three body checks. Of course, Landeskog stole the show. He had a goal and an assist, five shots and eight hits (really?). His game was solid and he keyed the rush to tie the game. Regardless, Buffalo’s neutral zone forecheck was close to nonexistent and Weber’s soft play gave Landeskog and easy lane to shoot and pursue the rebound. Passive net-side play allowed Ryan O’Rielly to get the puck through and in front to McGinn. Ryan Miller actually played a pretty strong game. He made 38 saves and was able to keep his team alive for a good part of the game. At some point, you need him to make a save on one of the goals, especially if you give him four to work with. But I honestly had little issue with his contributions this evening. Two wide-open tap-in goals are really to blame here. Funny to see Miller’s adjustment to O’Rielly’s chance last night and the read he made on Monday against Montreal. Expecting a stuff attempt by Erik Cole, Miller held his post and was beaten on the cross-crease one timer. It seemed as if he had a better grasp of the time on the clock yesterday, making himself big and hoping to block as much net. For those just blaming Miller, the chance hit the side of the net, Mike Weber’s shin pad, the post and then rolled across the goal line. Had Weber stayed on his side of the ice, the puck stays below the goal line and there is someone available to tie up Jamie McGinn. Miller made the right read, he was done in by a bad bounce. I have liked Alex Sulzer. He even beat Cody Hodgson to his first goal as a Sabre. I wonder if his play will be a factor when the Sabres evaluate their defensive depth this summer. Brayden McNabb is a fine defensive prospect, he is even a solid guy to insert permanently. However, when you have to bump Sulzer and Weber to increased roles to fill in for regulars like Sekera and Myers, there is a serious problem. Between the defensive depth issues and the lapses in-zone, trading Paul Gaustad is finally biting the Sabres. His absence has not been a major issue, you can just see certain areas weakening due to his trade. Considering the give and take, I’d still make the trade. I’ve long questioned Buffalo’s attitude when holding a lead. I truthfully cannot say whether it is a personnel or coaching issue. 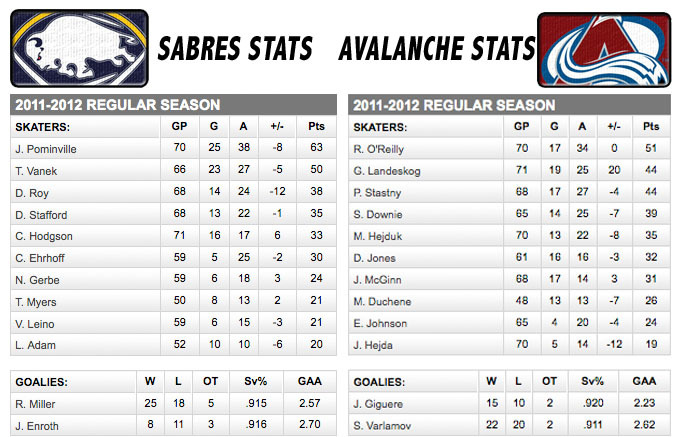 But to see the Sabres sag back and attempt to shell-up for the umpteenth time, makes me question “the system”. To give up 16 third period shots in the middle of a playoff race with just a one-goal lead is criminal. Lacking that killer instinct is something that needs to be addressed. Whether that is accomplished with a new coach or players with certain intangibles, the change needs to be made. 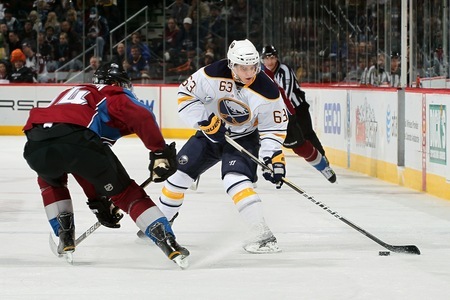 Tyler Myers was hit with a three-game Shanaban after giving Scott Gomez a face full of glass on Monday night. Tonight’s visit from the Avalanche will be the first game Myers misses. The suspension to Myers was warranted and is the appropriate length. What is completely asinine is the fact that the NHL continues their completely inconsistent manner of evaluating supplemental discipline. Evgeni Malkin lowered virtually the same hit on Johnny Boychuk over the weekend and escaped with a minor. Maybe if Tyler Myers was one of the league’s most electrifying players in the middle of the Hart Trophy race he wouldn’t have been suspended either. Is that really a difficult conclusion to come to? Buffalo will play their first without Myers – 11 points (4+7), +9 since the All-Star break – against a Western Conference foe pushing for a playoff spot of their own. I’d expect to see Brayden McNabb in the lineup for the next three games. He has been playing solid hockey for the Amerks and has the physical edge the Sabres will need for the remaining games this season. Andrej Sekera could be in the lineup, although it seems like a serious longshot. I would count on McNabb stepping in for at least the next three nights. The Sabres offense has still been struggling to find the back of the net, but they are creating chances. Peter Budaj made 33 saves on Monday and Buffalo has put at least 30 shots on goal in three of their last four. It is time for the Sabres to start capitalizing on their chances, scoring three or four a night will give this team a very real shot at achieving the impossible. Cody Hodgson. The newest forward on the team is still finding his way. I’m not sure if it is a conditioning issue, fatigue from playing on a nightly basis, his arrival and subsequent puddle jump across the country and further participation on Buffalo’s west coast trip or just a systematic problem. What I do know is that a number of fans are getting anxious about his potential. It would be nice if he got a few points over the next few games. Despite what the box score says, he hasn’t been all bad. In case you hadn’t heard, Chris Drury played in, and won, the Little League World Series. No fooling. In a related note, Captain Clutch is calling it a career. After an underwhelming and injury plagued tenure with the New York Rangers, Drury was bought out earlier in the summer and has decided to retire from professional hockey all together. What this tells me is his degenerative knee condition is more severe than originally expected in July. There were many who figured he would find his was onto a contender’s roster at discounted rate for the 2011-12 campaign. After all his face off skills, penalty killing and other intangibles would be very attractive to a team making a Cup push. Alas, his injuries likely played a large role in this decision. Drury was, and will be, one of my favorite players of all time. Ever since his first seasons with Colorado I was a fan of his style and skill. When he was acquired by Buffalo I was ready to do back flips. Drury was part of some of the best Sabres hockey in the history of the franchise. He, Daniel Briere and the rest of the core players carried the team to the Eastern Conference Finals in back-to-back years in what was one of the most memorable runs I can think of with this team. Then, of course there was the goal. Who else? So I was a bit off in the middle. Not too many people would have bet on that epic collapse by New Jersey and I, admittedly put far too much stock in Brian Elliott and Pascal Leclaire. Philadelphia overachieved (according to my original calculation) and I vastly underestimated Tampa Bay. Washington was a pretty easy choice to make, as was keeping Atlanta, Florida and the Islanders at the bottom. Otherwise it was a hodgepodge of close calls and near misses. Since the West is such a crap shoot it would have been pretty hard to predict either way. I gave LA too much credit and it turns out the Hawks didn’t have close to enough depth to compete at the level they did last year. My biggest oversight was with Colorado at nine, turns out they really stink. The Western playoff picture is extremely interesting this season, with the amount of parity out there it isn’t a stretch to say that any team can advance and any team could have finished two to four places higher.